Spreader Beams mized interior geometry reduces instal- Modulift has revealed its newest prod- lation time as well as provides a faster uct range, Subsea Modular Spreader recovery, the manufacturer said. Beams, designed to safely hold weights www.te.com up 500 metric tons. Outland Technology introduced a new ? nished with a three-coat paint system underwater LED laser, model UWL- 810. With uses ranging from ROVs, The Swedish Defense Materiel Adminis- based on a two-pack epoxy paint com- tration, Försvarets Materielverk (FMV), bination. Modular elements produce a dive cameras, to ? 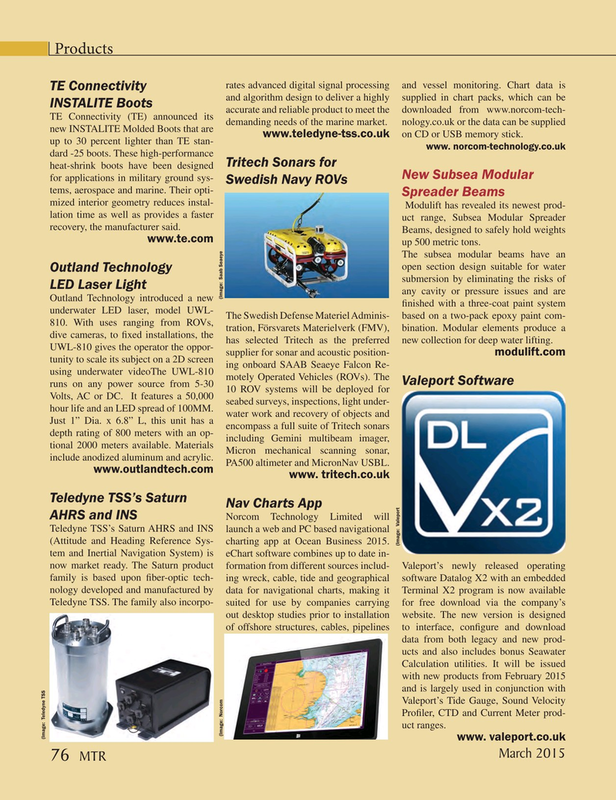 xed installations, the has selected Tritech as the preferred new collection for deep water lifting. Just 1” Dia. x 6.8” L, this unit has a encompass a full suite of Tritech sonars depth rating of 800 meters with an op- including Gemini multibeam imager, tional 2000 meters available. Materials Micron mechanical scanning sonar, include anodized aluminum and acrylic. Pro? ler, CTD and Current Meter prod- uct ranges.